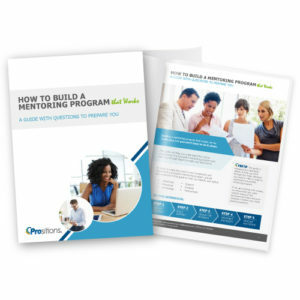 How to Build a Mentoring Program That Works, a Complimentary Downloadable Guide from Prositions | Prositions, Inc. How to Build a Mentoring Program That Works, a Complimentary Downloadable Guide from Prositions | Prositions, Inc. Since 2012 Prositions has been at the forefront of the growing movement to help automate and facilitate mentoring in the workplace. In honor of International Mentoring Day (January 17, 2017) they are giving back to the mentoring community by offering their new How to Build a Mentoring Program Guide complimentary to the public and announcing the release of the new MentorString mobile application. Along with this free guide, Prositions is also releasing its new MentorString mobile application. It is built for use with the cloud-based version of the software to access notifications, development/action plans, and profiles from anywhere and at any time. The MentorString software helps organizations facilitate and automate a mentoring program, connect and develop employees in an organization of any size, and deliver individual action/development plans to accelerate learning.